City Representative from Olstyn, Gabriela Przybyla ’17 (Gdansk, Poland/ Scotland, SD), was the first of many alumni to organize projects to be carried out during the winter months. On December 20, Gabriela organized a bake sale to raise funds for her high school’s student council. Around 150 students participated in the fundraiser. Later in December, Alumni Coordinator Mykola Artemenko ‘14 (Vinnytsya, Poland/ Powell, OH) organized a Christmas Card Exchange so that alumni could connect over the holiday season, regardless of the physical distance between them. Volunteering in the year 2018 was kick started by those FLEX alumni who participated in the Eastern Europe FLEX Ability Workshop. Kaja Figlarska ’17 (Krakow, Poland/ Northville, MI), Tomasz Laskowski ’17 (Warsaw, Poland/ Coatesville, IN), Jakub Musiatowicz ’17 (Warsaw, Poland/ Joshua, TX), and Zuzanna Wójcicka ‘17 (Warsaw, Poland/ Beach, ND) implemented the project Think Before You Drink, where alumni created an awareness campaign among party-goers in Warsaw of the dangers of driving while intoxicated. 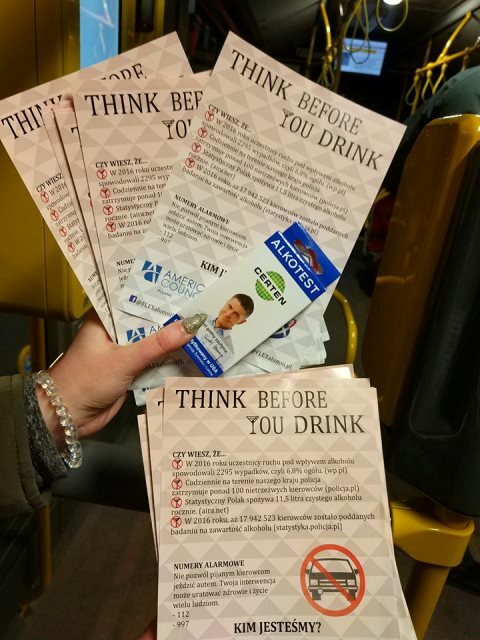 The team prepared flyers with statistics regarding intoxicated driving in Poland and shared this information with people walking the streets of Warsaw on the night of January 26. The alumni also handed out disposable breathalyzers for people to use before deciding whether or not to drive. 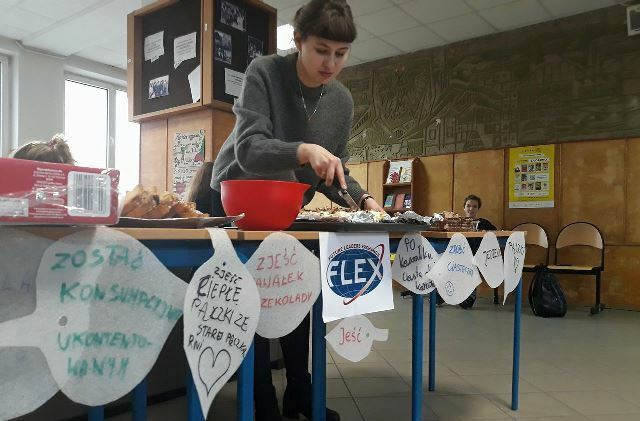 Gabriela Przybyla ’17 (Gdansk, Poland/ Scotland, SD) also implemented an Eastern Europe FLEX Ability Follow-On Project where she worked with her classmates and her school’s administration to organize activities to increase the level of school spirit at her local high school. Inspired by the activities that were organized at her American high school, Gabriela and her high school classmates in Olsztyn created matching T-shirts with school-themed slogans. The participants enjoyed spending time together, developing a sense of belonging, and strengthening their bonds of friendship. 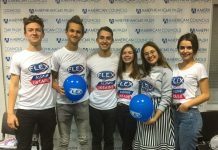 FLEX Alumni in Poland continued the Call Page project through which the recently-formed alumni community helps answer the questions of potential FLEX applicants. From December to February alone the alumni received 79 calls from potential applicants! Though small, this cohort of FLEX Alumni is extremely dedicated to spreading volunteerism in their communities and promoting the FLEX program in any way they can!